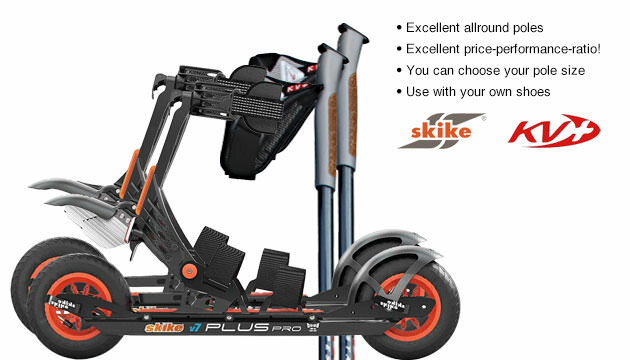 The Skike v9 PLUS Pro is based on the popular V07 PLUS by Skike. Use your own shoes. Equipped with several quick release levers and high-end belts Skike v7 PLUS Pro is a very comfortable cross skates for beginners and advanced skaters. The Skike v7 Plus Pro is an enhanced version of the legendary Skike v07 by the popular brand Skike. The brakes are equipped with cooling gills, that help to cool the aluminium during the braking. This reduces the abrasion of the tires. The Skike v7 Pro does have new strap clips and quick releases. Another novelty are the mud flaps on the front and back wheel. The skates can be worn over regular shoes. There is the option to adjust the skates to in- or out-knees for individual fitting.